Megan Hession, from Cardiff, attended Whitchurch High School in the city before going to university in Coventry to study business and event management. When she graduated in 2014 she moved back to Cardiff and planned to pursue a career in corporate events. While looking for a graduate job she went to work part-time at health and social care provider Montana Healthcare. But while working there she found out about its apprenticeship programme and decided to forge a career in the health and social care sector instead. 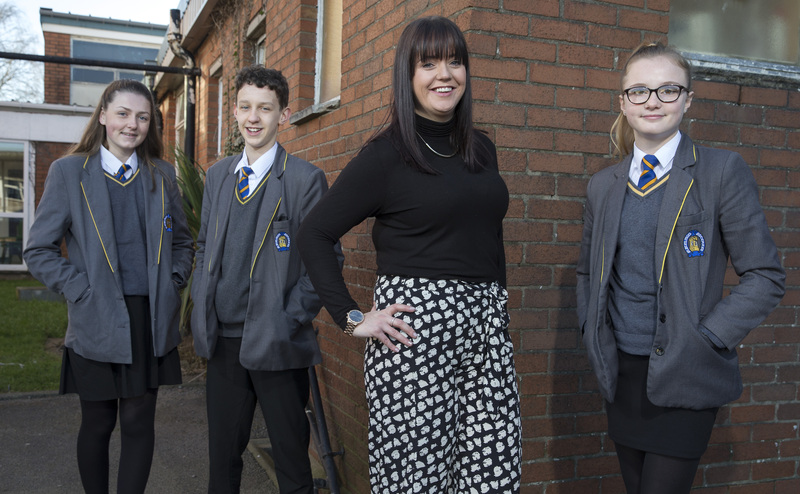 Megan has now worked her way up to managerial level, thanks to the apprenticeship scheme, and hopes her story will show pupils at Whitchurch High School that apprenticeships can be key to career success. She says, “I completed my level 3 apprenticeship in Health and Social Care in 2015, my level 5 Leadership and Management for Health and Social Care Services in May 2017 and my advance practice in September 2017. I’m now looking at progressing on to Level 7 Diploma in Health and Social Care Management. I started as a support worker at Montana Healthcare but I’ve been promoted three times while at Montana Healthcare and I’m now a team manager, managing over 20 members of staff. “I cover two supported living properties – one in Bargoed, in the Rhymney Valley, and one in Caerphilly. One property has five residents and the second has three. The supported living properties cater for people with a variety of needs. So we support people living with brain injuries, learning disabilities, physical injuries, autism, people who’ve had a stroke or a heart attack, for example. Montana Healthcare also offers care to people living in their own homes too. “Some people think health and social care and supported living is just about personal care. But it’s so much more than that. Our aim is to empower the individual and promote their wellbeing and support them to do things for themselves. If they’re unable to make a dinner for themselves, for example, we would get them involved with a small task such as peeling potatoes so they feel valued in the process. Megan says the is a job is a rewarding one, and she is motivated by helping people do the small things that we take for granted. “There are three other managers who are over thirty, so I’m the youngest manager here. We have a number of younger people working here and they’re so positive about their jobs, it’s brilliant to see. And for young people coming into the job I think it’s good for them to see young people in management roles and see that it’s achievable. Karen Rowley, HR and training manager at Montana Healthcare said, “Megan started with us as a volunteer at 16 and she’s now managing a team of her own. We’re so proud of her development and that she’s taking the time to inspire others to consider the apprenticeship route. Minister for Welsh Language and Lifelong Learning, Eluned Morgan, said, “Megan is a perfect example of how apprenticeships can transform lives, helping people into careers. Apprenticeships highlight the importance of gaining practical, on the job experience that provides people with the skills and qualifications they need to build a rewarding career. “Apprenticeships play an important role in increasing Wales’ overall skill set and driving economic growth, making sure that the nation remains competitive on the world stage. Apprenticeships are a worthwhile investment for employers who can train their workforce in the specialist skills they need to sustain and grow their businesses. “National Apprenticeship Week is an important celebration of the fantastic opportunities apprenticeships offer to individuals as well as businesses across Wales. “For individuals, apprenticeships can be a route to an exciting and fulfilling future career. Through apprenticeships, companies are helping to keep vital skills and industries alive and drive economic growth in Wales.